With this Two Hearts Beat as One diamond ring in 14K white gold from Apples of Gold Jewelry, you can be sure you will not only turn heads, but remember how much you are loved! With two diamonds, rated G-H for color and I1 for clarity, you can be sure you are getting high quality and beauty. Available in 10K, 14K or 18K white gold, this ring features two hearts - one inside of another, with two diamonds in the centers. The diamonds are 0.02 carats each, and 0.04 carats total weight. 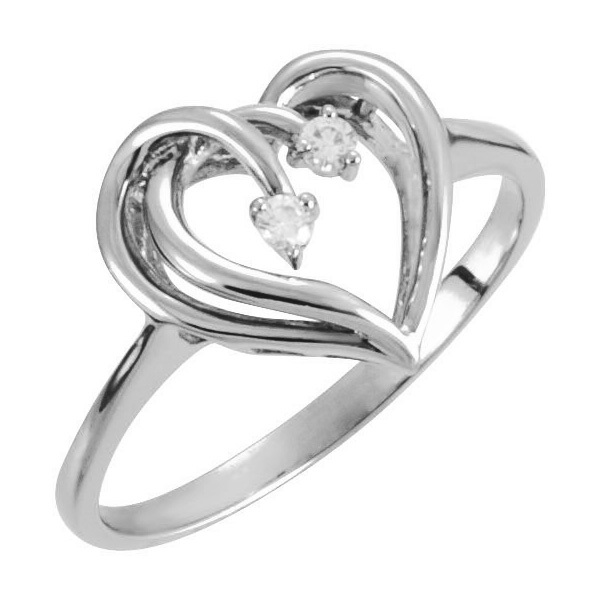 Perfect for couples or to show yourself love, this ring will quickly become a favorite! We guarantee our Two Hearts Beat as One Diamond Ring in White Gold to be high quality, authentic jewelry, as described above.